How To Binge Star Wars.. the right way? Here at The Group Real Estate, most of us love Star Wars. We love to sit at home, on those cold Idaho nights, days, even mornings, and watch Star Wars. As I have watched Star Wars, and the sequels, prequels, stand alones, cartoons, etc for all of my life, there are so many different ways to binge watch Star Wars. As you go through the different Star Wars movies, depending on when you started watching them, what your first, or second, even third experiences were, or are. Depending on how you enjoyed them as kids, some people first saw them as adults, and some didn’t see the true trilogy until the prequels hit. Eventually when The Force Awakens came out two years ago, there were even more people binging the prequels and original series, getting ready for The Force Awakens. And now, with The Last Jedi about to hit here in the next few months, this will all be happening again. For those of us who grew up with Star Wars, their kids, new generations who are excited to see The Last Jedi, due to the way it looks, or just their experiences with Force Awakens and Rogue One. With Rogue One, this adds in a whole new film to the mix of it all. Now the best way to approach this, is dependent on if you’ve seen the movies before. Sadly, as a main stay Star Wars geek, I can get through the prequels. I’m able to still watch them, knowing that the original trilogy, Rogue One, and Force Awakens are on the horizon. And as a stalwart Star Wars nerd, I am able to look past a lot of the crummy tropes in the prequels and somewhat enjoy them. Though, I do know that they are terrible. Especially the first two. Now, if someone hasn’t seen Star Wars, you don’t want to put a bad taste in their mouth by starting with the prequels. So, if you haven’t seen the original trilogy, at all, you will want to start with them, and experience them the way that everyone else in the world experienced them. When you watch them the way that you are supposed to, in the linear way, this is the best way for everyone to experience it. Lin Manuel-Miranda was quoted saying, “chronologically, when it was released. Absolutely. I had a pretty good time experiencing it that way. Linear is the best way to do it.” One of the main reasons for doing this, is that those who went into the prequels knew, as they were raised watching Star Wars, Empire Strikes Back, and Return of the Jedi by the weekends, that Darth Vader was Luke’s father (spoiler, in a sorry, not sorry type of way – it’s just common culture to know this, even if you haven’t seen the movies), and that we knew he was a good guy before he turned evil. So as you watch them chronologically like this, it gives you the same feeling. Plus, knowing that you can then finish the day off with going back to the wonder, magic and awesome power of Force Awakens, after you had just seen a terrible 6 hours worth of Star Wars. 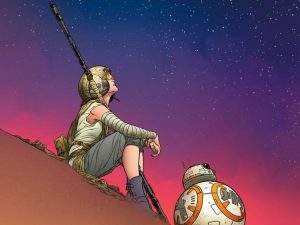 Now, coming from someone a lot younger, from Daisy Ridley (who starred in The Force Awakens as Rey), who is in her early twenties, says to watch them this way: “I would say, 1, 2, 3, 4, 5, 6, because for a younger person it’s easier to understand the chronology.” Now, as I go on saying this, I somewhat agree with this, but will only do this when I am watching them with my young kids. With how dark and sad Episode III is, it is nice going into the heroism of Rogue One and on to A New Hope. Though, if Rey from the one that I put as the top 3 favorite, maybe top 2, is telling me how to watch them, maybe I take a listen. Now, George Lucas himself has said to do it the same way that Daisy Ridley said to do so. He said that is how they were always meant to be watched. However, with the main hatred from true Star Wars fans, who don’t want to watch the prequels and don’t like them, this is most likely some kind of a ploy, as George directed all three of the pseudo-hated prequels. So, as they are terrible, as a true Star Wars fan myself, I have done either way. One of the redeeming qualities, though some direction truly even ruins him, is Ewan McGregor through all three prequels as Obi-Wan Kenobi. 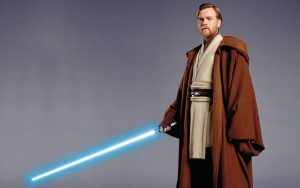 Now, there are so many Star Wars fans who truly want an Obi-Wan standalone movie, with McGregor reprising the role. Now, to say that he was great in the prequels, isn’t fully true, but he is pretty darn good. Also, the Duel of the Fates score from John Williams, is a masterpiece. As a Star Wars nerd, one of the fun ways to watch them is what is called the Machete Order. This lets you watch Star Wars, then Empire Strikes Back, which leaves Luke pondering on the way Vader is his daddy and how Vader became. So with that, you will then move to watching the prequels, to which you then come back to Return of the Jedi and The Force Awakens. This keeps the story centered on Luke Skywalker and helps you feel more empathy towards Anakin/Darth Vader. If you are feeling super wanting with Star Wars there are a lot of ways to go, especially in regards of Rogue One and the Clone Wars cartoons. There are some amazing, but week taking ways, to do these. With many seasons of two different versions of the Clone Wars cartoons, you can watch all of these, which will take weeks, before you go into Episode III. Also, Rogue One, though a very sad war time epic style film, which has a very sad ending, can be watched before A New Hope. This brings a better light to what is happening in A New Hope. However you choose to watch them, please know that the original trilogy is special and is known to be some of the best cinema in the history of movies. Especially Empire Strikes Back, which is in the wells of greatest films of all time. Leading towards The Last Jedi there are a lot of different ways, versions and exciting things to watch, love, and learn from the originals, the prequels, the cartoons and everything fun, before The Last Jedi hits theaters this December. So, whichever way you may choose, have fun with it, love them, laugh at them, cry to them, and always remember, May the Force be with You!